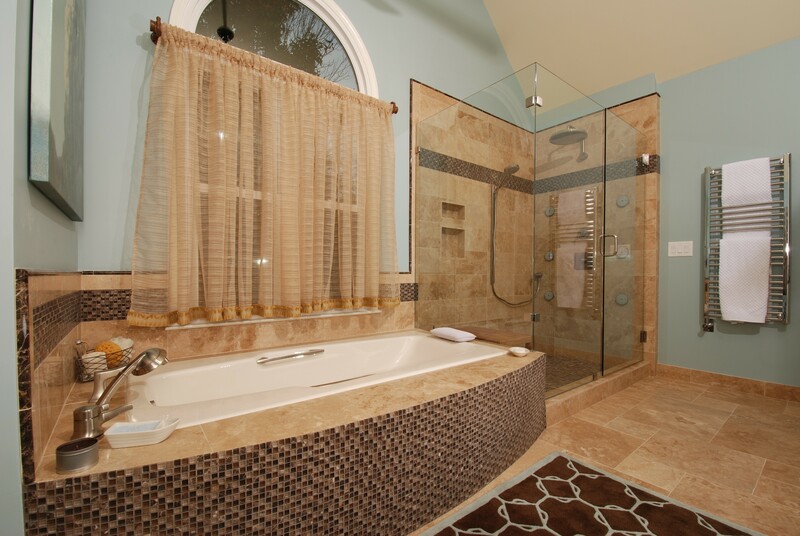 Modern conveniences abound in this master bathroom. 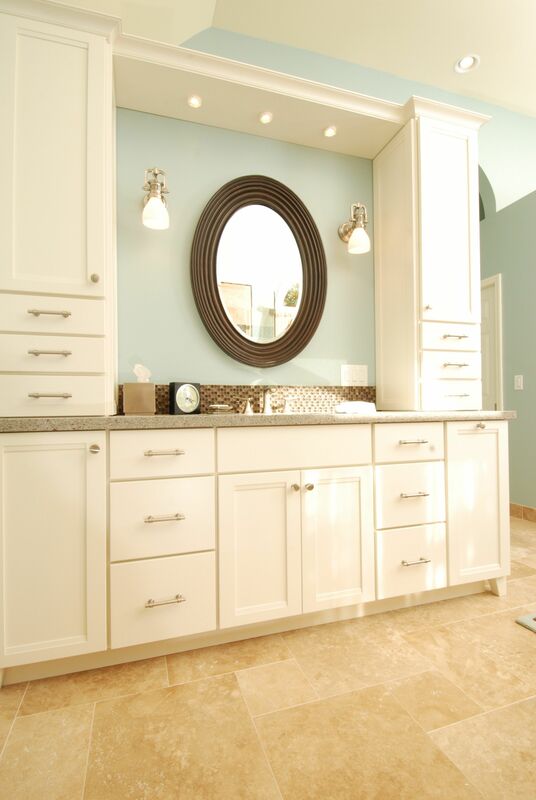 Large double vanities give both homeowners plenty of space to organize toiletries and store towels. 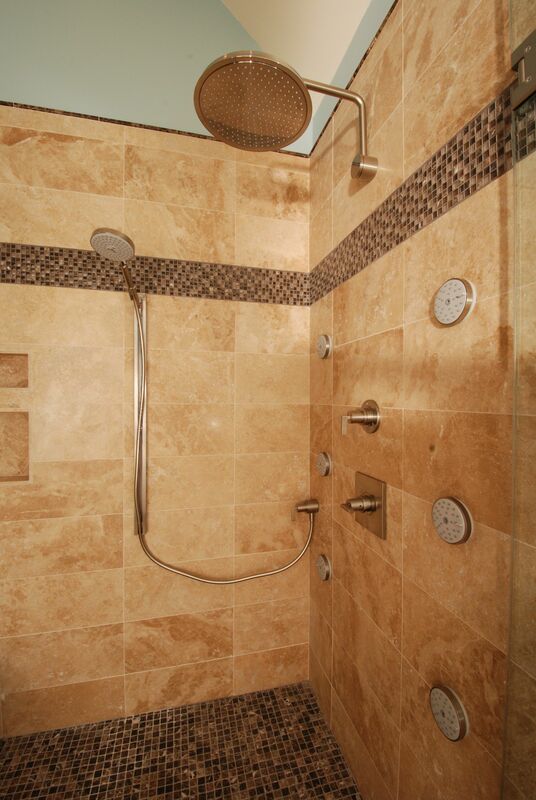 The shower features six body jets, a large rain shower head, and a hand held shower. 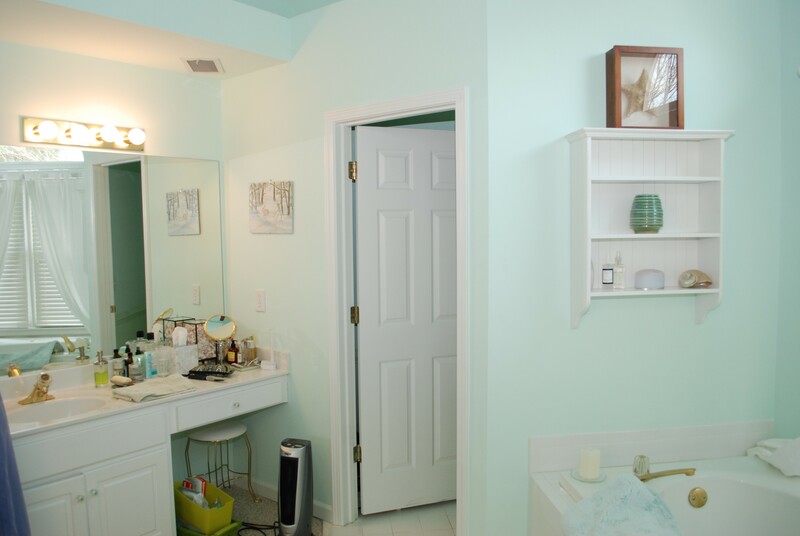 In the course of this project we were able to significantly expand the bathroom by recapturing unused space, make the closets more functional by straightening walls, and the room more cozy by lowering the ceiling. The result is a relaxing retreat that our clients enjoy every time they use it. 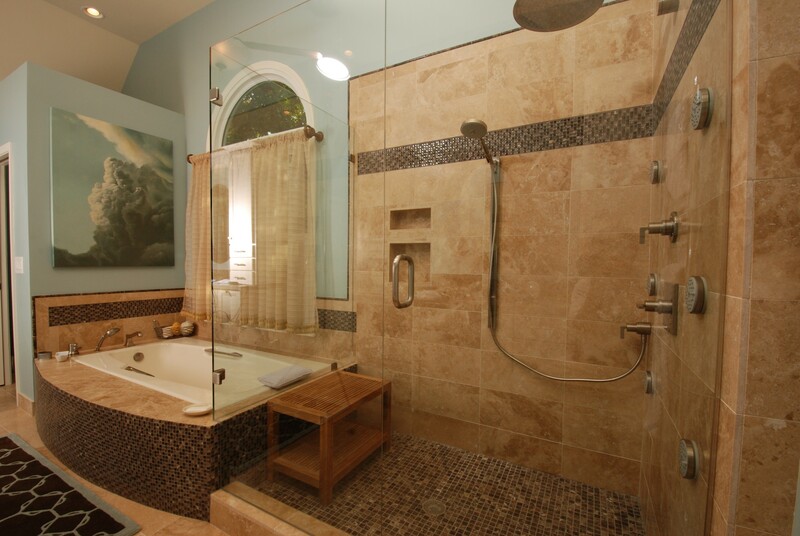 The homeowner wanted a large shower. Instead of a built in bench, we recommended a free standing teak bench. This allows the bench to be moved and have less of a visual impact that a built in bench. It’s also much warmer to sit on in the winter. We kept the his and hers vanity arrangement in the renovated bathroom. Both of the vanities were the same and have nine drawers and a laundry hamper. In the upper cabinet on this side are the controls for the bathroom audio system. 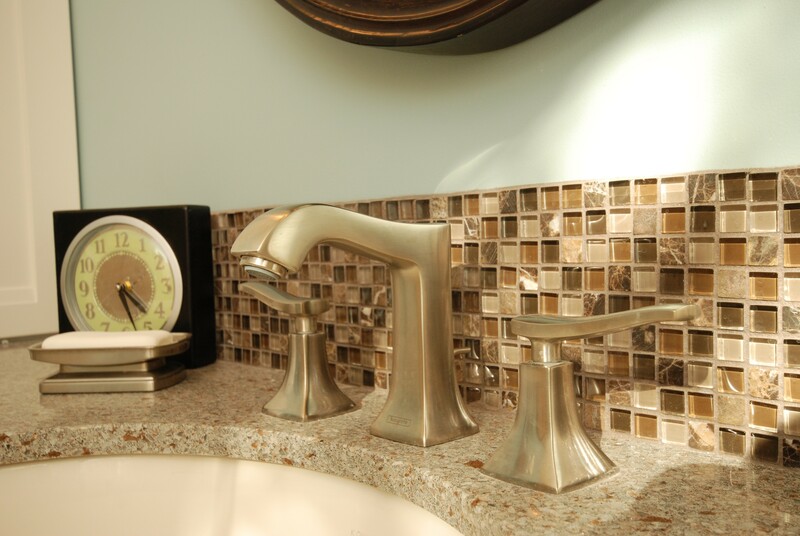 The back splash behind the sinks is glass mosaic tile that sets off the contemporary styling of the faucets. The shower has a number of conveniences. The large Hansgrohe rain head is the main feature and there are a number of body jets and a hand held shower head. The upper vanity cabinets each have three drawers. They are perfect for the things that are generally create clutter on the counter top. 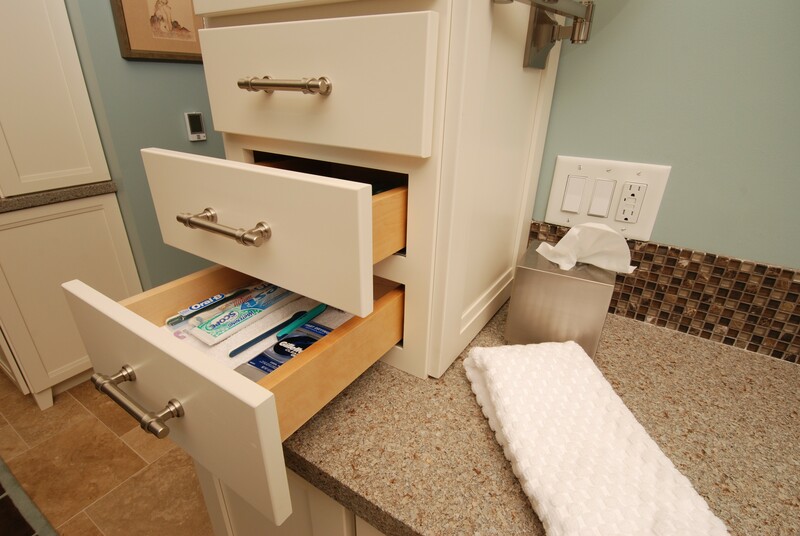 The cabinet above has an outlet for plugging in tooth brushes and other bathroom appliances. 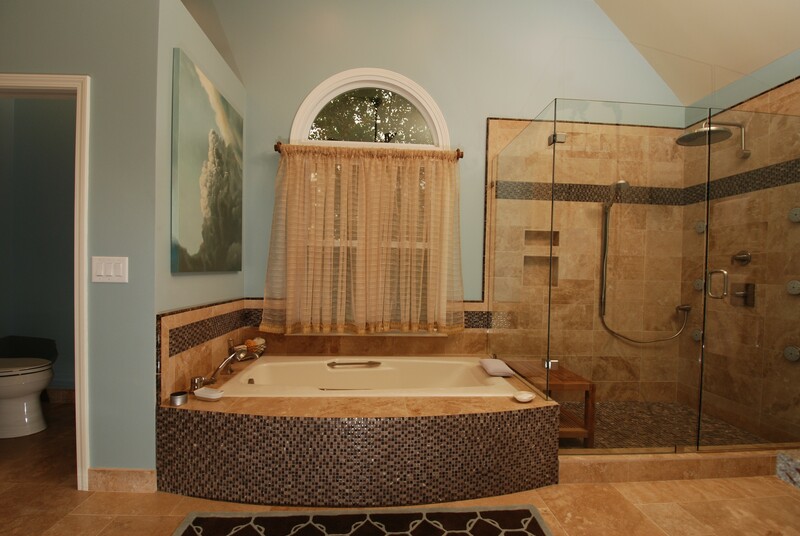 Another view of the tub showing the wide deck and flush mounting that makes it easy to get into and out of the tub. 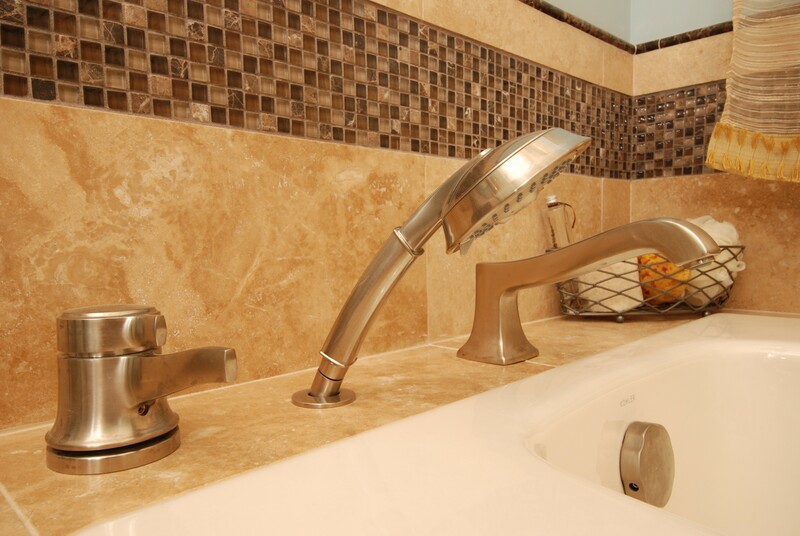 The handles are recessed into the tub and are discrete but functional. This tub has a hand held shower head in addition to the regular filler. The homeowner wanted it to be easy to transition into and out of the tub so we set the top of the tub lip flush with the surround tile. To make sitting on the edge easy, we built the tub deck a bit wider in the middle and selected a tub with built in handles. Next to the shower we installed a towel warmer with a timer. It’s programmed to come on in the morning before the homeowner wakes up and have the towels warm before they take a shower. There’s plenty of space. 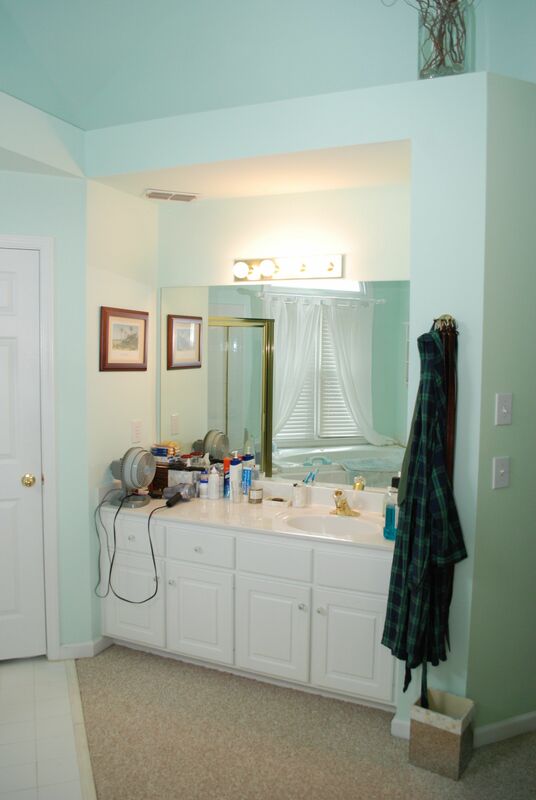 By drawing the original bathroom we were able to find wasted space behind the angled walls and incorporate it into the finished bathroom and closets. 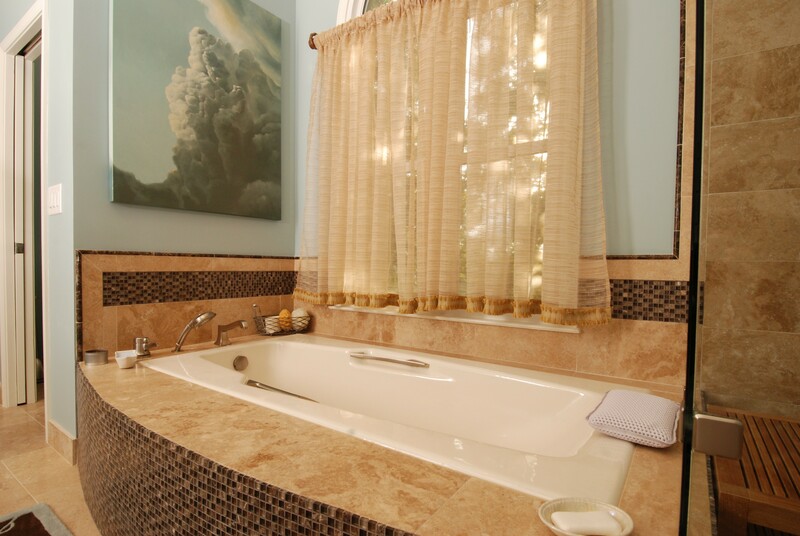 This allowed for significantly larger vanities, a bigger tub, and finally the large shower the homeowner wanted. A closer look at “her” vanity. We added a lighted make up mirror and there are both overhead lights as well as sconces to make the light even and soft. 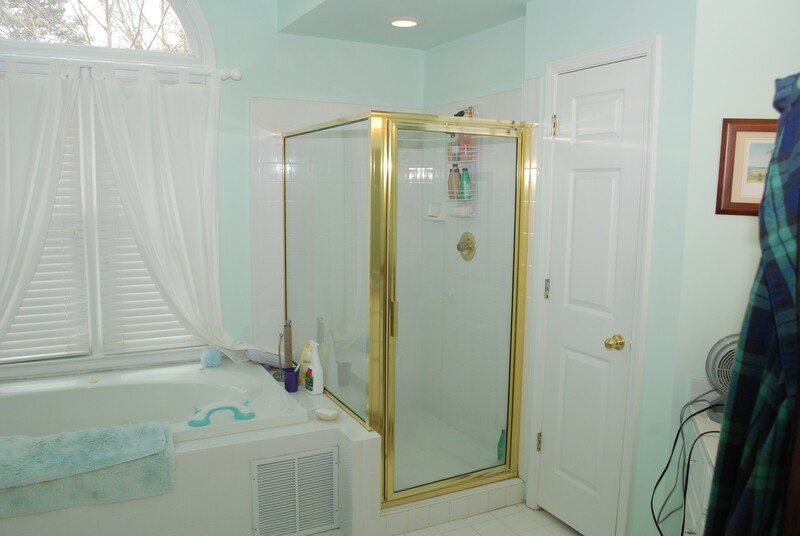 The original bathroom had a small shower that was typical of homes built in the 1990’s. The brass trim dated the room. Before the renovation, the vanities were very small and the space utilization was very poor because of all the angled walls. This angle is a before shot of the “hers” vanity. There is virtually no storage and only one drawer. The bathroom had a his and hers vanity arrangement that we kept with in the renovation. This is a before picture of the “his” vanity. 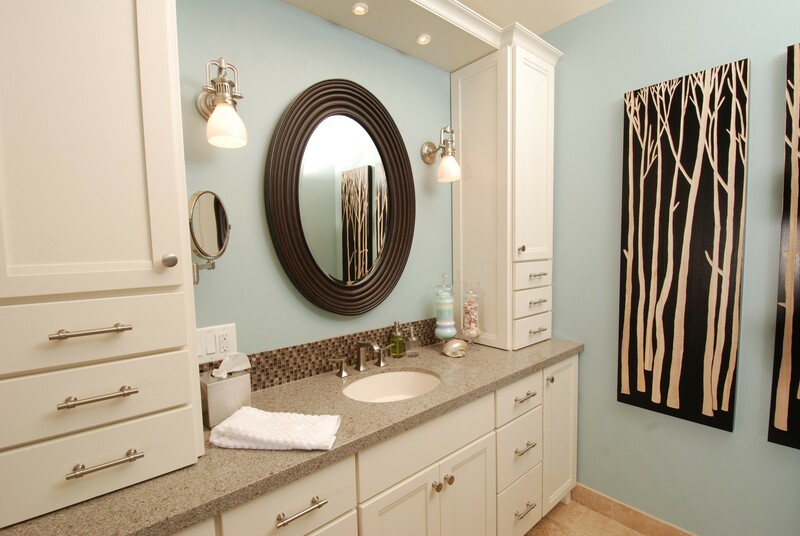 The design of both vanities resulted in poor storage for the homeowner.